"It's heaven in Earthly entertainment!" 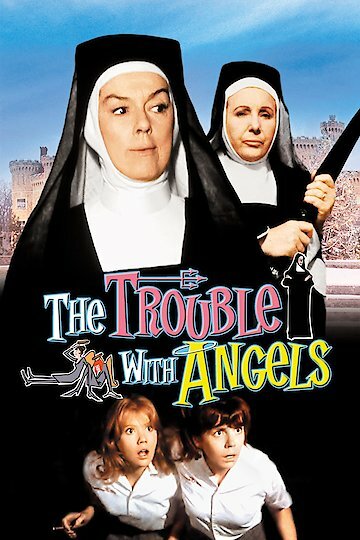 The Trouble with Angels is a story about a rebellious teenage girl who is sent to a Catholic high school. The teen is named Mary and she does not like to adhere to rules and regulations. Mary forms a friendship with another girl in the school named Rachel. The two get into trouble by cutting classes and doing things that are not in keeping with the rules of the school. The girls often like to hang out in the bathroom and smoke cigarettes. This lands them in trouble when a fire accidentally breaks out from a smoldering ash. Mary is usually the instigator of the acts which land the two in trouble with Mother Superior. The Catholic school is also a boarding school so the girls live in rooms inside the school. Mary is not well liked by the other girls because she causes so much trouble. The other girls like the classes and activities they participate in at the school, which includes an all girl band. While the girls live at the school during the school semesters, during the holidays and summer break they are allowed to go home. On one trip home for the summer, Rachel ends up spending her summer in France where she gets a complete makeover to look more grown up. When the girls reunite after the summer is over, Mary has also grown up in her own way. The movie spans the four years Mary is at the school during which time she observes the practices of the nuns who are there. She often watches Mother Superior as she goes out to pray in silence. She is amazed at the patience the nuns have and their continuous efforts to help mold her into the type of person they believe she can be. The story ends with the graduation where Mary finally informs Rachel of her decision to become a nun. The Trouble with Angels is currently available to watch and stream, buy on demand at Amazon, Vudu, Google Play, iTunes, YouTube VOD online.